A French naval chart of the Rio de la Plata - famous for the wealth it produced for the Spanish Empire. Carte de La Riviere de La Plata depuis son Embouchure jusqu'a Buenos-Ayres d'apres les Plans leves en 1789 et 1794. An extremely scarce large format c. 1800 French nautical chart or maritime map of the Rio de la Plata, Argentina and Uruguay. This elegantly presented map covers the entire estuary from Los Cerros de San Juan to the Laguna de Rocha. It extends south to approximately 55 degrees south latitude. The chart includes the important ports of Buenos Aires, Sacramento, Montevideo, and Maldonado, among others. The detail is primarily coastal, extending only about 10 miles inland, but the terrestrial detail offered throughout, including topography rendered in hachure, is extraordinary. Nautically the map offer a multitude of soundings and outlines of several shoals. Two large inset maps offer extraordinary detail focused on the ports of Maldonado and Montevideo, both in modern day Uruguay. Shore profiles line the top of the map. 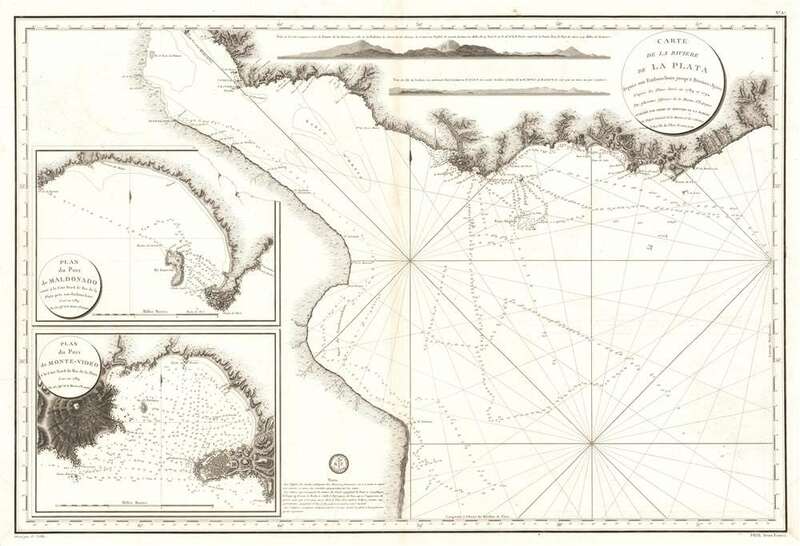 The hydrography for this map is credited to Spanish marine surveys accomplished between 1789 and 1794. Although not specifically noted, this can only refer to the Malaspina Expedition undertaken during this same period. The expedition was jointly led by Alessandro Malaspina and José de Bustamante y Guerra. Theoretically the Malaspina Expedition, which was sponsored by the Spanish government, was a purely scientific endeavor in the spirit of Cook or La Perouse, but Malaspina quickly became involved in local politics and later attempted to overthrow the government in order to liberate the colonies - an act for which he was subsequently arrested. Nonetheless, the scientific accomplishments of the mission were substantial despite being largely suppressed by the Spanish government in light of Malaspina's treason. In the course of the voyage Malaspina twice visited the Rio de la Plata, on this outbound route in 1789 and again on his return in 1794. Both visits resulted in the new survey information that was incorporated into a very similar Spanish Deposito Hydrografico carta esferica issued in 1798, from which Malaspina's name is notable omitted. The 1789 carta esferica is clearly the basis for this French chart issued just two years later. Although seemingly sparse, the precision and hydrographic detail presented throughout redefined the cartographic perspective on the region and represents a significant advancement over 18th century charts issued by Nicholas Bellin and others. The map is dated in the title cartouche according to the French Republican Calendar, 'L'An XI de l'Ere Francaise' or the 'the 9th year of the French Era'. This corresponds to 1800. The French Republican Calendar was intended to remove religious and royalist influences and was popular between 1703 and 1805, which it was formally abolished. Very good. Minor wear on original centerfold.